I’m grateful to Craig Adams for his thoughtful interaction with my previous post on finding our Wesleyan voice. Craig made some good points to which I’d like to add a few further comments. I’m glad Craig agreed that entire sanctification is the right place to begin an effort to reclaim a Wesleyan voice. But in his view the challenge is the reality that this is out of step with where most Methodists are theologically. I agree completely, and I think Craig’s observation that most Methodists are shocked or confused to learn that something called “Christian perfection” was central to the birth and spread of the Wesleyan tradition. In fact, this was my experience. 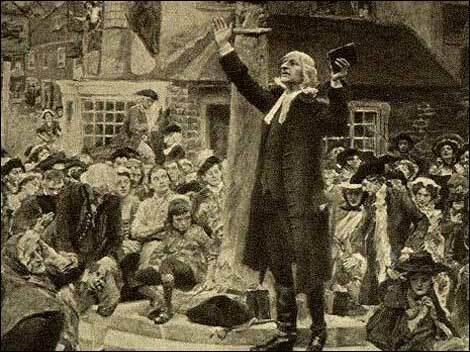 Though I have been United Methodist from childhood, I didn’t start reading Wesley until college. And I was very surprised to discover that he had written a book called A Plain Account of Christian Perfection. I was well into the United Methodist ministerial candidacy process when I discovered this was the defining point of our theological tradition. At first, I was frustrated; then I began studying Wesley’s understanding of sanctification and reading books by some living theologians who thought Wesley was on to something. What I found was stunning and compelling. I remember thinking long ago that there had to be more to Christianity than forgiveness, as vital and beautiful as that is. My discovery of Wesley’s doctrine of entire sanctification became that something more for which I was looking. Given the lack of emphasis on Christian perfection among Methodists, Craig further suggests that beginning a renewal effort with a focus on this doctrine will “be an exercise in swimming against the stream.” I think he’s absolutely right. The point I want to make in response is simply this: that’s what makes it renewal. All efforts to renew anything, not least the church, are a matter of swimming upstream. We wouldn’t need renewal if something important were not lost; and finding something that has been lost so long that it is no longer missed presents real challenges. We must not be discouraged. Wesley himself knew this reality well. His efforts to renew the Church of England were nothing if not an uphill battle, and entire sanctification was essential to the effort. We may be swimming against the current, but that is in the DNA of Wesleyan revivals. I’ll take the conversation a step further by pointing to another theme that has come up in the #AndCanItBe discussion on Wesleyan essentials: we need a structure to cultivate the realization of the holiness for which we call. We must have practices that support our theological distinctives. Wesley accomplished this by organizing the early Methodists into groups of varying sizes for discipleship, formation, and accountability. An authentically Wesleyan vision of Christianity will involve both an emphasis on entire sanctification and the practices that enable and cultivate that transformative growth in holiness. The method is essential to the successful appropriation of the theology. The distinctive combination of these two emphases will be essential for another Wesleyan revival. Brandon, very excited to hear you are teaching this to your youth. Keep fighting the good fight. Craig, I've had a couple of opportunities to preach at camp meetings. Learned a lot about the holiness tradition through them and by reading people who preach in those venues. Thanks again for interacting. Whereas I encountered the message by way of the holiness camp-meeting (which shows my age, I guess). But, it took me a long time to understand it.